This city is located in East Godavari district of Andhrapradesh in India. In Telugu (local language) the name is pronounced as Samarlakota. This town has the main railway junction connecting the broad gauge line between Chennai - Kolkata (and other places in North and South) to the district head quarters, Kakinada. Though this place is on the main lane of the broad gauge railway, it won't come in the National Highway 5 (between Chennai and Kolkata) path. 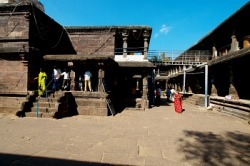 Samalkot is famous for the Shiva temple which is considered as one of the Pancharama temples. Samalkot is on the main railway path of broad gauge connecting Chennai and Kolkata. The station is after Rajahmundry if travelling from Vijayawada side. For travellers coming from Kolkata side, this station is after Annavaram (this is the main station and there are some more small stations in between Samalkot and Annavaram). Though Samalkot is the main Raiway junction, not all the trains stop in this station. So, select your journey and plan depending upon the train you are travelling by. People travelling by bus from North have to reach Visakhapatnam and travel towards Rajahmundry in NH-5. After Annavaram ( approximately 120Kms by road) proceed in NH-5 upto Kathipudi and take left turn near an overhead bridge on Highway. Take the right turn before reaching the place called Pithapuram. And again after 8 Kms take right turn. Samalkot is 15 Kms from this turn. The distance between Annavaram and Samalkot is 40 Kms. It is 12 Kms from Kakinada. For travellers coming from Vijayawad side, have to reach Rajahmundry. After Rajahmundry, proceed in NH-5 to reach a place called Prathipadu. At prathipadu take right turn to reach Samalkot which 20Kms away. The very famous Pancharama Shri Kumararama Bheemeshwara Swamy temple is situated in Samalkot. The temple is just beside the railway station. So no transportation is needed for people travelling by rail to reach the temple. This temple is dedicted to Lord Shiva (Adhi Devudu). This was known as Purva Chalukya Bhimavaram because the Eastern Chalukyans ruled this place. Now, a canal of Godavari river flows between Bhimavaram and Samalkot. The temple was built by Chalukya Kumara rama (son of Vikramaditya) during the end of 9th century. He got this temple constructed to register his victories in more than 300 wars. The temple premesis almost resemblance the other Pancharama temple at Draksharama which is also called Bhimeswara Alayam. There are carvings of Apsaras on pillars in the temple. A mantapam supported with one hundred pillars can be seen. 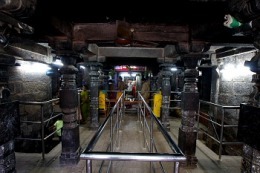 Eka Shila Nandi is kept at the temple entrance opposite to Shiva lingam. Darshan of Shiva lingam is at the first floor. Steps are available at both the side. Goddess Shri Bala Thripura Sundari (Tripura Sundari) statue can be seen at temple premesis. To the East side, there is a mantap called Koneti. 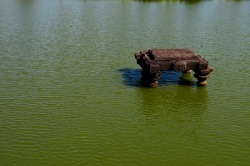 Pushkarni (Pushkarini) lake can be seen here. 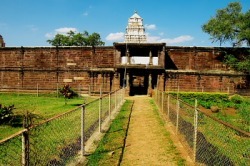 The main entrance to the temple is called Surya Dwaram. There are quite a good number of devotees visiting this temple. The total maintenance activities are taken care by the Government of Andhrapradesh. Several parts of the temple are in a very bad shape and renovation activities are going on. Along with this activity, a garden is also being made for visitors to make this place a picnic spot. During November-December (Karthika and Margashira masam) months daily Abhisheka is carried out. There will be Utsavam (Kalyana Mahotsam) during February-March (Magha Bahula Ekadashi day) time. Till Maha Shivarathri grand celebrations in the temple can be seen. There will be a car festival during Sivarathri. 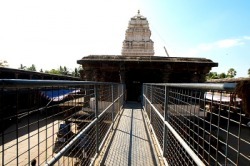 Lord Bhimeswara Swamy is installed (Prathishthapana) by Kumara Swamy (son of Lord Shiva and Goddess Parvati) and hence the temple is called KumaraRama. Temple timings are from morning 6.00am to 12.00 noon and after noon 4.00pm to 8.00pm. Additional places of interest around Samalkot include Draksharama, Annavaram, Thalupulamma Thalli and Rajahmundry. Budget hotels are available in Samalkot to stay. 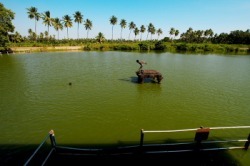 Travellers can also make Rajahmundry as the center place for their trip.